A mini With Love card cross stitch kit to make as a gift. The card simply says ‘With Love’ so it could serve many purposes; a thank you card, a condolence card, any occasion when you wish to let someone know that you are thinking about them and that you appreciate them, because you care …. 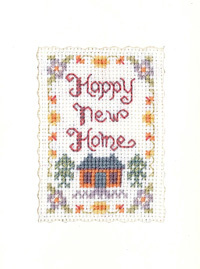 This ‘With Love’ card cross stitch kit contains everything needed to create a greeting card on ivory 16 aida. The greeting card kit has only top quality materials; Zweigart fabric, DMC threads, needle, card and envelope. There are full instructions and a clear chart. This mini With Love card design is from the Decorative Textiles collection.